And get your January desktop wallpapers here. Think she needs to fix the valley talk, 'you know' speech first. Normally not into astronomy stuff. But the visual is fantastic and the music haunting. Something here to keep our spirits up. Norad tracks Santa (www.noradsanta.org) is bypassing Singapore. Heck, it's even missed Kuala Lumpur. Santa is not too concern with bringing gifts for the children living in the big cities of this region? This application is rejected by the Apple Store. Pity, it would be a great way to explain how the iPhone built-in accelerometer works (tongue in cheek). Spec ads: short for speculative ad to show potential clients or employers samples of your writing. The winner has to be the iPod. Easy and cheap and cook up, catchy and effective. I love the Netherland's remedy for a hangover. Have fun. Lots of videos and info. More awareness test. (via Mr. Brown). The original (first) do the test is still my favorite. The show thrown at Bush is a Ducati Model 271. Wow. New way to search clip art for your next cheesy powerpoint presentation. Put a web site's url after http://bacolicio.us/ to get your bacon. No practical use at all other than to see a strip of bacon on the site. Mmmmm,... bacon. This is scary. Really scary. OK no one is killed here, but the snooze (shock) can be deadly. Death by Waterslide, actually chlorine.. It's not what you think, or is it. 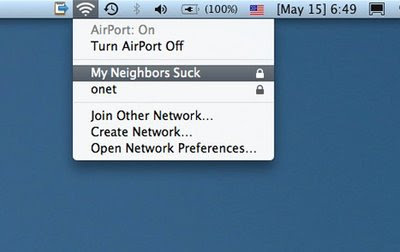 Not sure if this is a real Wireless SSID, but it sure is funny. And this was a 15 year old comic! YouTube - Mactini -The Peter Serafinowicz Show Christmas Special - BBC Two-CosmoPod. Obama is Time Person of the Year; who are runners-up? Is the whole global economy downturn a giant Ponzi scheme? Started watching this funny clip and didn't stop until I watched all available Target Women clips on YouTube. Didn't take long for someone to come up with a game. On the side note, the Japanese praise Bush on his reflexes. Probably the most watched video today. Down to the Final Corner from Sovrasterzo on Vimeo. All the highlights, including the one in Singapore where Massa is spotted with a tail (fuel pump still attached). It's quite funny. That should be in the movie. Clarkson extreme review of the Ford Fiesta, including a shopping center's run-in with a Corvette and a beach assault with the Royal Marines. Hilarious all the way. The cat is definitely not doing yoga. Site with pictures of sleeping Chinese. Weird. Living in the clouds. What about Skype and IM? Comic Sans, a silly font? After almost 3 weeks (and lots of late nights), my experiment with installing another Linux distribution for my Asus Eee 900 netbook has more or less come to a conclusion. After numerous installation (Ubuntu, Mandriva, etc), countless reinstallation and testing, I'm settling now with Mandriva One. I had never spend so much time just on a single objective. Through it all, I must say that at least I had learn a lot more about Linux, beyond the little I had to do sometimes in my work with Unix. Linux on the client is not for the faint of heart. One can easily break the OS from all the hacks and tweaking. I can understand now why Asus's provides little option for changing the delivered Xandros OS. With different kernels, distributions, package managers, windows managers, one wonders if having so many choices (each with their own issues) is such a good thing. What I have learned from this experience is that tough as it may be, Linux can really be a substitute for MS Windows if you are willing to spend the time learning how it works. Every application I have on my Windows PC has the same or equivalent Linux counterpart, including My Dropbox and Skype, etc. The only application I could find for Linux is the PCSuite for my Nokia phone. Hello Nokia? What does all that facts tell us? That's not a phone, it's a computer. Too bad it would not be out for another few more quarters. A funny photoshop image with the spider. In case you are wondering what the spider is all about, here the full story. Recession is coming to town. Recession is coming to town! Thanks Karen for this email. With calendar. There many to choose from. Get your here.